Dental veneers are thin layers of material (either porcelain or composite) custom made to fit over teeth and improve their color, shape and overall appearance. Proper placement of dental veneers can greatly improve your smile and appearance. There are two types of veneers: porcelain and composite. When done correctly, both can give you a beautiful smile, but what are the differences between the two ? And how do you know which one is right for you ? Are you a good candidate for dental veneers ? Before choosing a certain type of veneer, you should first find out if dental veneers are the right solution for you. Veneers are not appropriate for everyone or every tooth; thus, case selection is a very important factor in the success of this technique. When are veneers most often indicated ? When are dental veneers not a good option ? Weakened teeth. If a significant amount of tooth structure is missing or has been replaced by a large filling the teeth will not be strong enough to function with a dental veneer. Dental crowns are more adequate solutions in this case. Severely malpositioned teeth or misaligned teeth, overbites and underbites. Orthodontic treatment is required to correct these more complicated problems. Habitual clenching and grinding of the teeth can easily chip or break dental veneers. Teeth grinding (also known as bruxism) must be treated before any placement of dental veneers can begin. Dental nightguards may be a solution for this in some cases. Composite veneers are done in one visit and are sculpted at the time of placement. 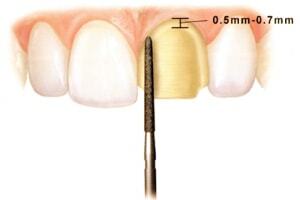 The composite resin is applied in layers to the tooth and modeled to the correct shape, length and form. Each layer is hardened using a curing-light. When all composite is placed, veneers need to be polished extremely well before they are bonded to tooth structure. Normally, a small amount of tooth structure has to be removed to allow for placement of composite resin in the desired shape without added tooth bulk. In most cases, composite veneers are more conservative of tooth structure as less amount has to be removed compared to porcelain veneers. When are composite veneers most effective ? Composite cannot fill in large spaces so many dental professionals will recommend not to use composite veneers when you have big spaces between the teeth, very short teeth you'd like to lengthen, or have broken a large part of the edge of a tooth off. Modern composite materials can provide a life-like, beautiful appearance and can last for a reasonable amount of time (5 to 10 years). However, direct composite veneers involve extreme attention to detail as the final result depends entirely on the skill and artistry of the dentist. Choosing the right dentist can be sometimes a challenging process; however, you should make sure you feel comfortable with the doctor before starting the procedure. 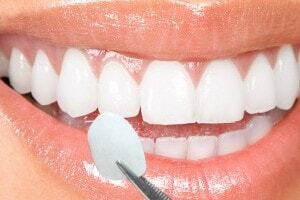 What are the advantages of composite veneers ? Composite veneers can be accomplished in a single visit. Porcelain veneers are fabricated in a dental laboratory and therefore require at least two visits. While this is not a general rule, composite veneers need less tooth preparation. Composite veneers are more affordable; the cost is usually about half that of porcelain veneers. What are the disadvantages of composite veneers ? Composite veneers are not as durable as porcelain veneers and more maintenance is required as they are more likely to chip. Composite veneers tend to stain more easily (you might consider this especially if you smoke or drink coffee or red wine). Here is the reason: composite is a porous resin while porcelain is glazed and impervious. Porcelain veneers are one of the most beautiful restorations available in cosmetic dentistry. Porcelain veneers are always manufactured in a dental lab after an impression of the prepared teeth is taken by the dentist. Depending on the initial condition of the teeth, more or less of the teeth structure will have to be removed in order to accommodate the veneers. This is done by trimming the enamel from the front and biting edge of your teeth. A porcelain veneer is usually about 0.5 to 0.7 millimeters in thickness. Once bonded to healthy tooth structure it becomes very strong. When are porcelain veneers indicated ? 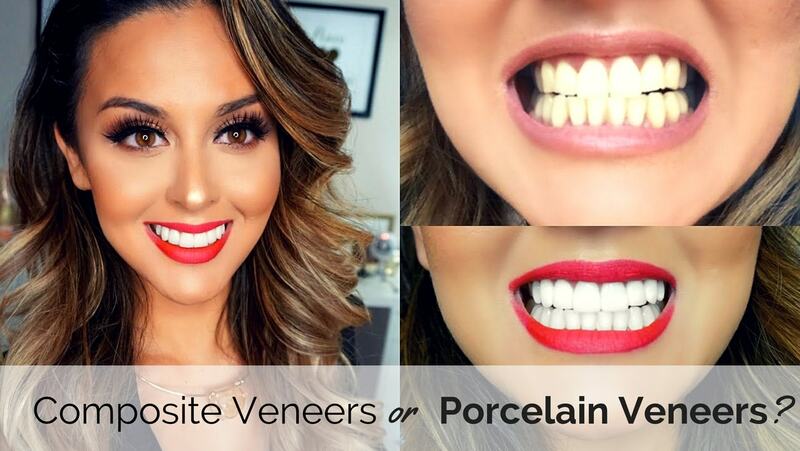 Porcelain can fill in much larger spaces than composite; therefore, porcelain veneers can be used in any situation in which dental veneers are a viable treatment option. 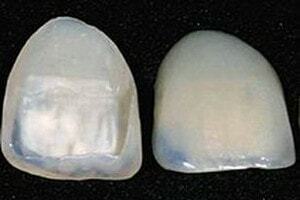 Porcelain veneers are very strong and durable, they rarely chip and are color stable. Lifespan is between 15 and 20 years if you take good care of them. Another thing you should consider is going with a dentist who works with quality ceramics and a highly qualified technician; this gives you the best chances to achieve great esthetics. What are the advantages of porcelain veneers ? Porcelain has a translucent, light-reflective quality similar to tooth enamel; as a result, it can mimic natural teeth in a way which is not possible to achieve with any other dental material. Porcelain is color stable because there is a glaze placed on the outside which makes it extremely resistant to staining. Porcelain veneers are very durable and they rarely chip. What are the disadvantages of porcelain veneers ? Porcelain veneers are fabricated in a dental laboratory and therefore require at least two visits. Porcelain veneers are more expensive than composite veneers as their placement requires more time, expertise and resources. Porcelain veneers cannot be repaired. If they break, porcelain veneers must be replaced. Now you know a little about porcelain and composite veneers. So what is the best choice ? The answer is that your decision should be based on a number of factors. The first thing you should find out is whether you are a good candidate for dental veneers. Sometimes a teeth whitening procedure is enough to improve your appearance while in other situations the teeth are too weak or the misalignments to severe for dental veneers to function. Your doctor can help you decide which procedure or combination of procedures is right for you. Make sure to tell him what you would like to achieve. Porcelain veneers are highly esthetic; nevertheless, in the right hands, composite veneers can achieve beautiful natural aesthetics as well. 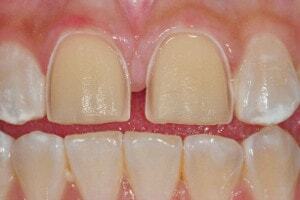 The important part is to opt for composite veneers only for the right situations. When larger spaces have to be filled (for example if you have big spaces between the teeth or very short teeth you would like to lengthen), porcelain veneers seem a better option. Composite veneers are more affordable and can be completed in a single appointment. The flip side is that more maintenance is required as they are more likely to chip and stain. Porcelain veneers are more expensive (almost twice as much as composite veneers) and need more time to be completed. Apart from that, porcelain is more resistance to stain and chipping, it does not wear under pressure, is color stable and better aesthetically. What care is required to maintain dental veneers ?